Emily is a part-time corporate interior designer, full time momma to 2 little girls and a newborn little boy. She blogs about daily life as a Indianapolis urban dweller at www.designhermomma.com. This guest post was originally published on her own blog as her entry in our Blissfully Frugal contest. Be sure to read all the entries and vote for your favorite. Recently, I was told by someone that I spend too much time on the computer (I know, the shame). While I’ll admit to perusing YouTube for things so funny I pee myself (like this dog video, and tutorial on how to gift wrap your cat ), I would like to think that this person doesn’t really get what I’m up to. Although it may look like I waste time Stumbling my TwittFace, in reality I’m really finding ways to save money. Many times I’ve been asked by my non-interwebby friends how I score good deals and find out about free stuff. Almost always, it’s because of social networking. Take twitter for instance. While on the surface it might look like a whole lot of mom’s sharing TMI about their kids; you can actually find out about sales and good deals going on. I’ve set up a twitter list that follows bargain hunters. I call my list “Ladies with the Supa-Deals“. 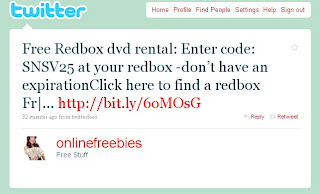 Oh look – here’s one for a free Redbox code. Go ahead, use it – it’s a valid. In addition to twitter, I’ve found that following a few key local bargain bloggers is really helpful when trying to find deals in your area, especially when it comes to groceries. It saves me both time and money by pairing up the manufacturers coupons with the grocery store fliers. I imagine I owe a lot of saved hours and dollars. Then there is this thing called Freecycle. It’s a site where people just give there stuff away. FOR FREEEZE. And don’t even get me started on Craigslist (looooooooove). I got both my dining room table and my buffet table from Mr. Craig. He’s a good man. Oh, and while it might look like I’m wasting time on Facebook watering my virtual garden, I’m really finding expensive stuff on the cheap over at kids steals because I’m a fan of theirs. Probably my last and final social media secret I want to share with you is something I like to call blog contests. My advice to you: ENTER THEM. I’ve won some really great stuff from blog contest. My favorite sites to find these lovely contest are Prizey and Prize-a-tron. And all the while, I have this little blog here that’s my little piece of cyberspace. I’m met so many awesome people because of this silly thing. Many of these lovely ladies are local, but many live far, far away. What I’m getting at (yes there is a point) is that social media has offered me both rich friendships and a fatter wallet. This post is being submitted to a Blissfully Frugal contest in hopes of winning a pass to the Blissdom Conference next month in Nashville, Tn. Why do I want to go? I’m itching to hug some long distance friends, show off my new baby boy, and maybe learn a few more things about this thing “I spend too much time on”.